The AquaKing System can solve your drinking water problems and provide safe clean water for you and your family. The AquaKing whole house water treatment system utilizes NASA ionization technology and the latest developments in high performance filtration. Unlike point of use systems, AquaKing whole house systems will provide safe, clean water to every tap in your house, not just the kitchen sink. First, the water passes through pre-treatment filters for sediment removal (20 micron, .3 sub-micron, or both). Next, the water passes through an activated carbon filter to remove unwanted taste, color, odor and chemicals. Additional filter cartidges can be added to allow the water to proceed through a unique catalytic media, ion exchange filter that can dechlorinate (remove chlorine), control bacteria and microorganisms, remove heavy metals (lead, mercury, etc. ), prevent water hardness and scale accumulation and remove iron. The catalytic filter can even help clean existing clogged water piping caused by calcium build-up. 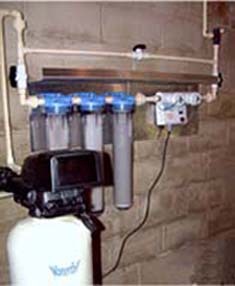 We can even add a filter to reduce nitrates in your water as well. In the final stage, the new NASA developed ionization system adds trace amounts of safe, natural copper and silver ions to kill deadly viruses. The copper and silver ions remain in the water indefinitely to provide long-term purification and protection from recontamination. With the system in place, you'll get "Nature's Perfect Water".